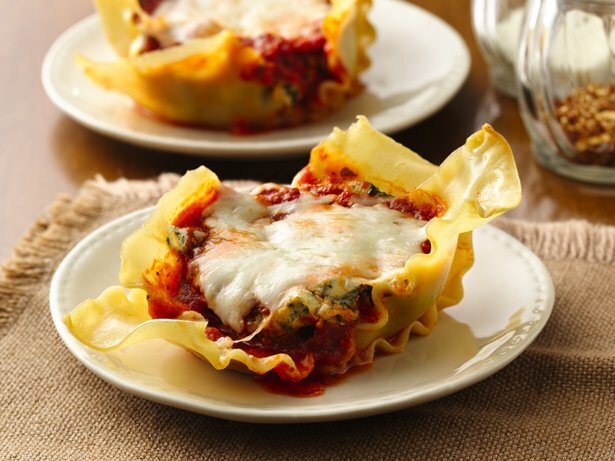 Line each muffin cup with 2 lasagna noodle halves, crisscrossing over bottom of cup, coming up sides of cup. Spoon about 1 tablespoon pasta sauce over noodles in each cup. In medium bowl, mix spinach, ricotta cheese, oregano, garlic powder, salt and egg. Place about 1/2 cup spinach mixture over sauce in each muffin cup; top each with about 3 tablespoons pasta sauce, 1 1/2 tablespoons mozzarella cheese and 1 teaspoon Parmesan cheese. Cover with foil. Bake 35 minutes. Uncover; bake about 5 minutes longer or until cheese is melted. Let stand in pan 10 minutes; remove from pan, and serve immediately. If desired, serve with additional pasta sauce.